If your business is in the search for nothing but the best, then Nextiva should be the first option you consider. Originally founded by CEO Tomas Gorny in 2006, Nextiva has yet to slow down with year after year of innovation. By 2008, Nextiva was up and running with early customers, and by 2017 they now provide service to over 100,000 customers worldwide. Nextiva’s unique cloud solutions allow any size company to establish the most capable and robust communication system possible – from the starting small to midsize business, up to airlines that routinely make international flights, and even Japanese-based automobile manufacturers. With a reputation for one of the top companies to work for, Nextiva offers a warm and positive atmosphere that even extends to their client base. Nextiva has won multiple awards for their outstanding U.S. based, in house customer service, with both friendly helpful agents, and minimal downtime for users when it matters most. Innovation is also something Nextiva is highly regarded for, as the provider is constantly changing the landscape and introducing revolutionary solutions and products. Their next generation call center platform, NextOS and data analytic solutions put Nextiva in a class of their own. If there’s one word that could be used to describe Nextiva, that would be “innovative.” Time and time again Nextiva is pushing their solutions into new paradigms, leveraging new and powerful technologies. NextOS is a clear example of Nextiva’s innovation and is the fruition of multiple years of development. 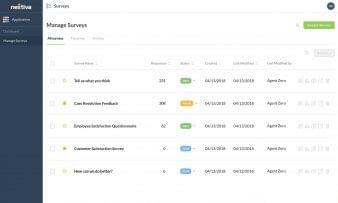 One could argue that the NextOS platform potentially represents what the future of cloud communications and CRM looks like, with one single integrated platform. NextOS really isn’t something that we have seen before in this space. It has become a trend to integrate and connect multiple solutions into one platform, but Nextiva takes that whole concept one step further. NextOS, as the name states, can truly be seen as a business Operating System. NextOS is one giant platform that enables organizations to manage users, features, billing, internal and external communications, analytics, CRM, surveys, and more. The idea is to provide an effortless experience by enabling users to gain unrivaled access to their tools and data, as quickly and easily as possible. With Nextiva’s ServiceCRM, your business can leverage a database of customer history, relationships and even employee information which provides deep insight into each customer across all touch points, and it can happen in real-time. Nextiva Chat enables your team to constantly communicate through this browser-based chat system, both internally with each other, and externally such as live chat directly on your website. 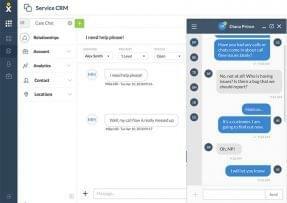 Nextiva’s already powerful Analytic platform has also been expanded in NextOS to provide analysis of all communication methods, including surveys, chats and emails. And speaking of surveys, Nextiva Surveys provides organizations the ability to create and distribute surveys for all data insights and analytics. Overall, NextOS can be seen as a new technology to solve previous communications crises, by ultimately giving users a real-time view of customers, as well as the ability to track the entire customer journey, and interact with those potential leads. By combining deep knowledge from a built-in CRM, and analytics to help make sense of all that data and information, businesses can gain entirely new insights into not only their customer experience and journey, but also their sales and support processes as well. With NextOS, Nextiva is looking to do more than just create an app with multiple features: they are establishing an entire operating system that will stand as the foundations for business communications and providing organizations with the tools necessary to provide the insights necessary to optimize efficiency in any way possible. What Do You Think of Nextiva?